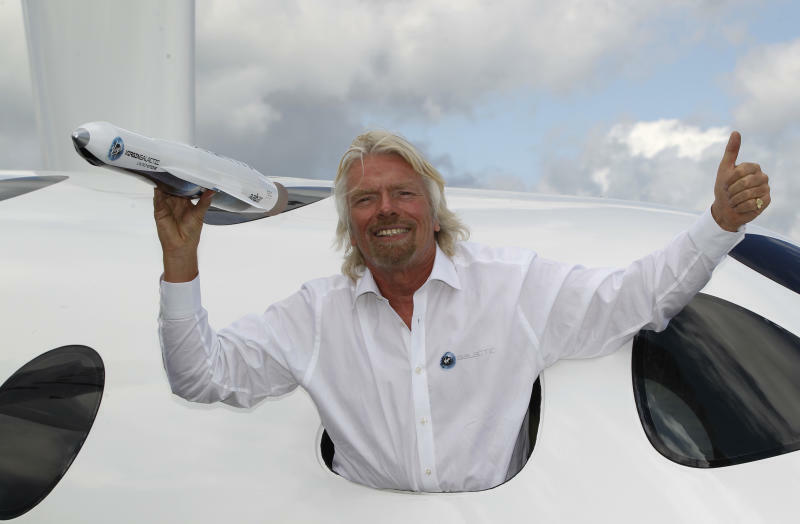 FARNBOROUGH, England (AP) — The first space flight of Richard Branson's Virgin Galactic venture will be a family affair: The billionaire adventurer confirmed Wednesday he will be joined by his two adult children. 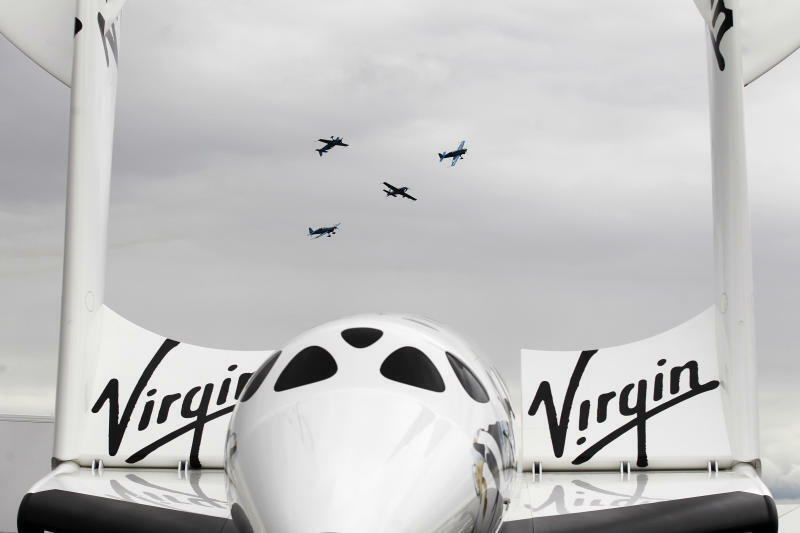 The British tycoon behind the Virgin business empire that spans cable television, airlines and space tourism revealed that the three will make the journey 62-miles (100 kilometers) above the Earth aboard the SpaceshipTwo (SS2) next year. Some 120 other tourists who have signed up for the $200,000 two-hour trips into space over the coming years were also present at the Farnborough Airshow south of London. "Next year, Holly and Sam will be joining me for a first voyage into space," the thrill-seeker told a packed conference on the third day of the show. "Going into space is a hard business. It keeps my mind buzzing." Virgin says it has 529 paid up passengers already — one more than the total of space travelers since the former Soviet Union's Yuri Gagarin became the first man to go into space in 1961. The future space tourists glimpsed a replica of the SS2 set up outside the auditorium as the actual one undergoes flight testing in California's Mojave Desert. It will take off from a spaceport in New Mexico that was designed by British architect Lord Foster. The craft is designed to seat six people as well as the two pilots. The tourists will have to undergo a week of training at the spaceport before taking their flight. "I wanted to be the first Irishman in space and I'm really looking forward to it," said 70-year-old businessman and author Bill Cullen, who said he was the first to sign up for the ride in 2004. Grant Roberts, 36, said his dream of space flight came from his grandfather, who was a pilot for Britain's Royal Air Force and flew on missions over Germany in World War II. 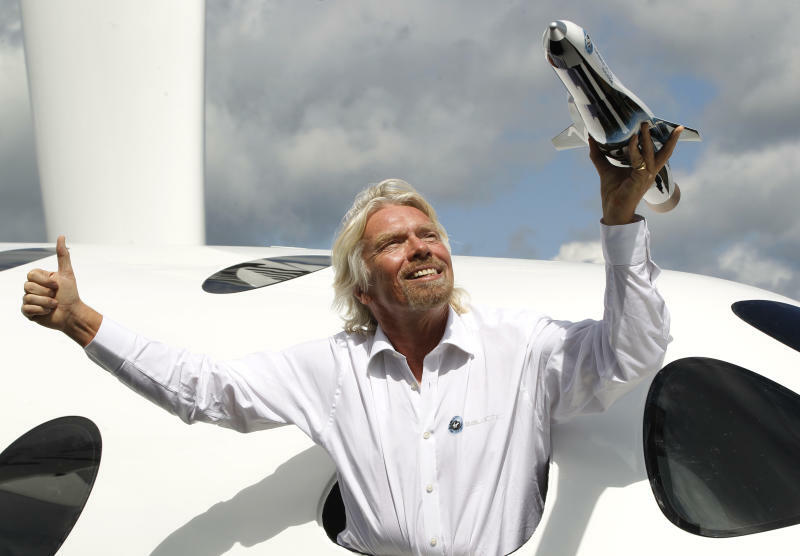 Branson also said a new launch vehicle — LauncherOne — would take small satellites into space at much lower cost than is now possible The Virgin Galactic team said a number of companies were hoping to use LauncherOne, which is expected to begin operations in 2016 and can carry up to 500 pounds (227 kilograms) of weight. "It will be a critical new tool for the global research community, enabling us all to learn about our home planet more quickly and affordably," he said.